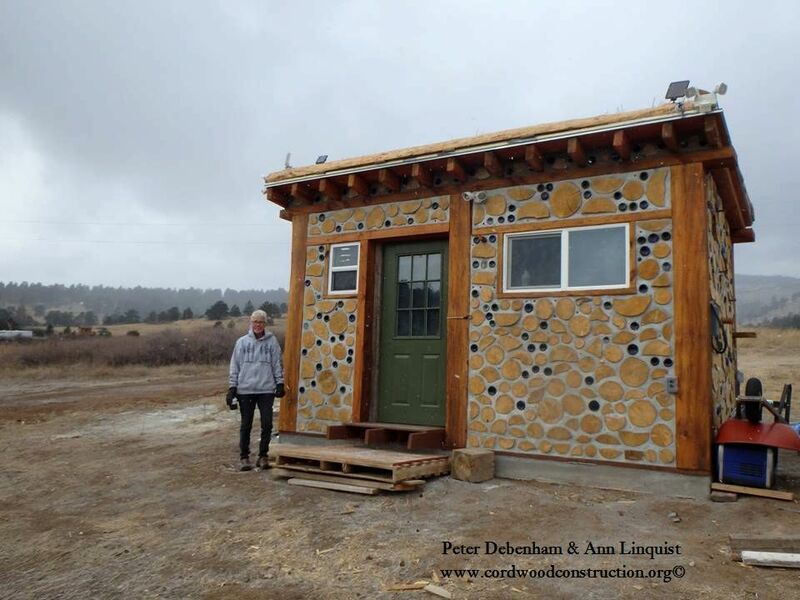 Peter Debenham and Ann Linquist built a lovely tiny cordwood cabin in Colorado. 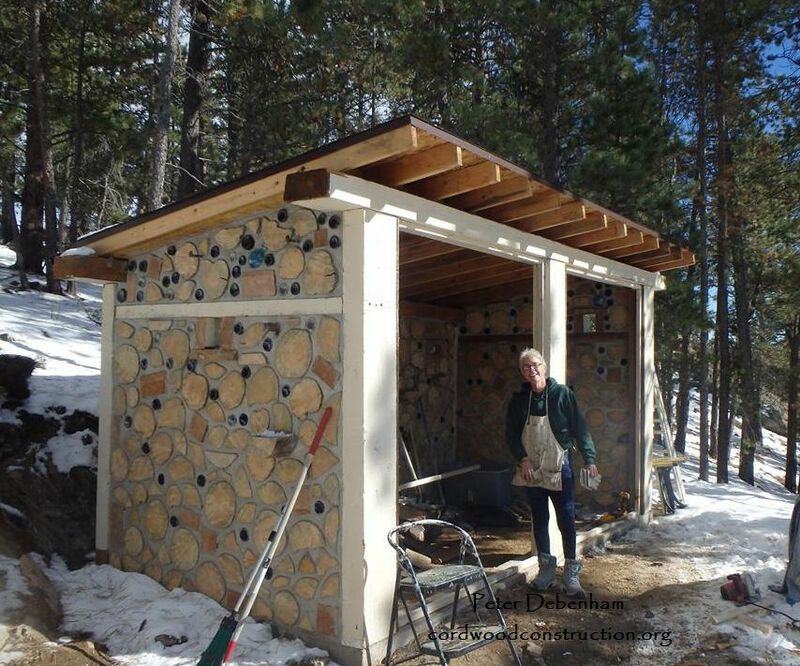 Their original practice building was a wood shed, but this is going to be a multi-use cabin. 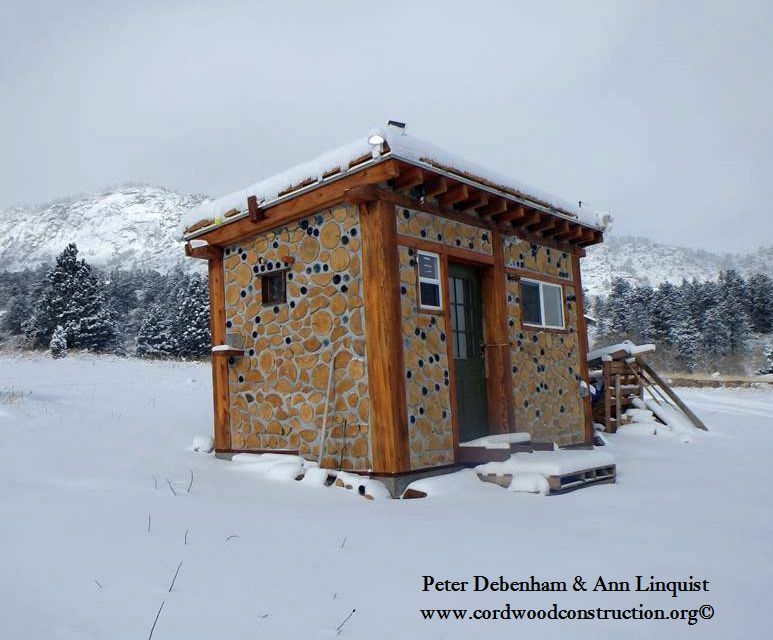 They are 10 miles from Estes Park in Drake, Colorado. 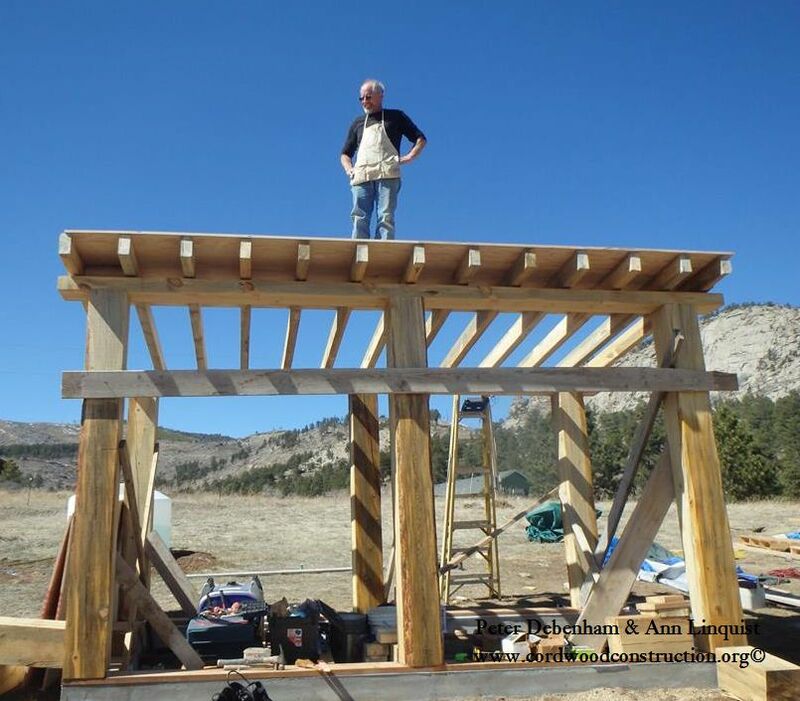 This is a 15′ x 8′ post and beam tiny home, cabin, shelter, shop, studio, etc. 120 sq. 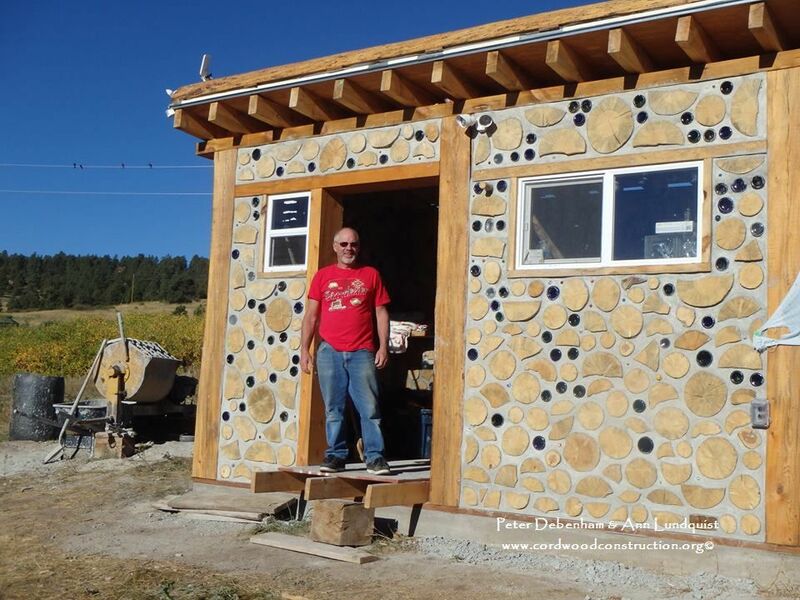 ft. with 10 inch cordwood infill. The generous use of bottles has made it even more attractive (just like the handsome couple). The bottles are colored both inside and out (not clear on the outside). 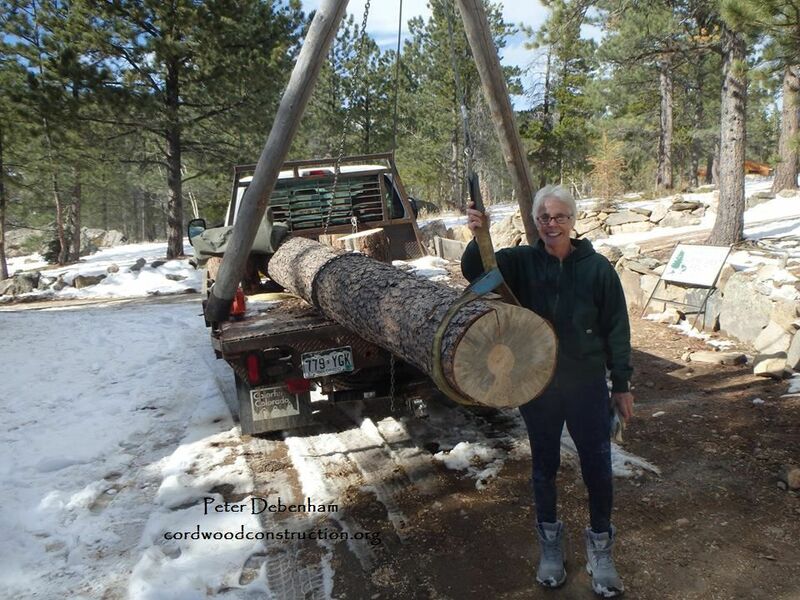 The wood is “pine beetle killed” lodgepole pine. 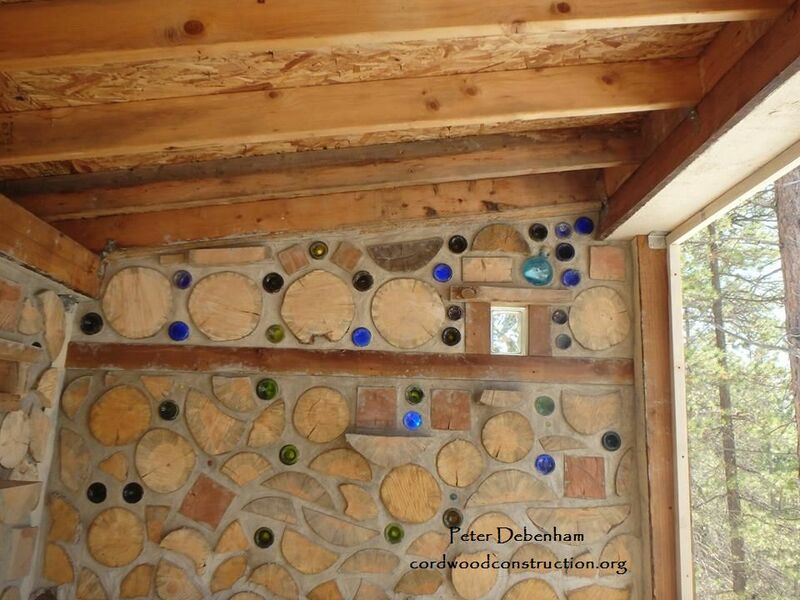 If you’ve been to the west you will see this is a great use of an insect destroyed resource. The Tiny Cottage nestles nicely into the mountains, forest and streams. It is what I feel Frank Lloyd Wright would call Organic Architecture. 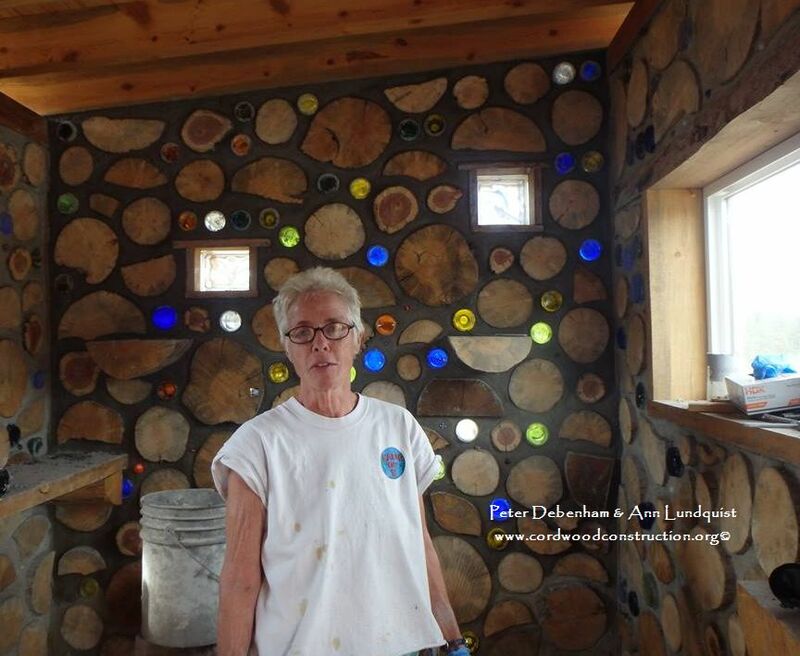 Ann proudly displays her tuckpointing skills. Notice (again) that the bottle bricks are colored on both sides. Peter stands on top of the outstanding framework happily enjoying the sturdiness and a refreshing breeze. . Under construction. 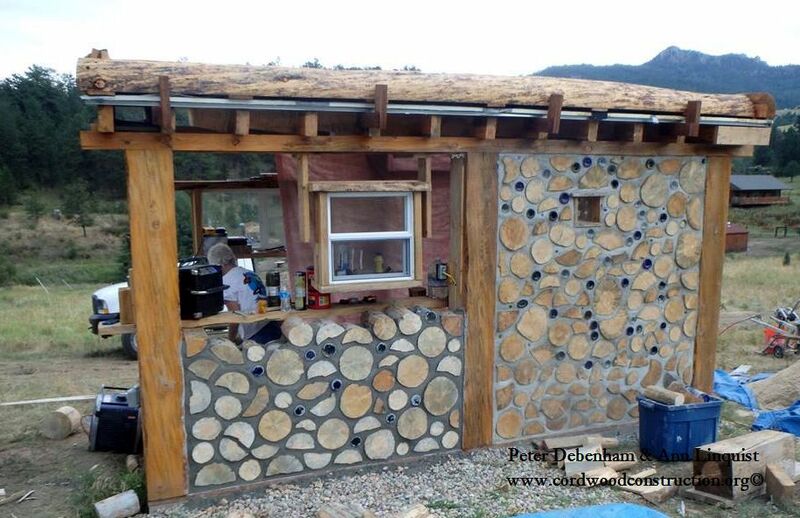 Note the well placed log ends, the clean mortar joints and the colored bottles. The roof is a living roof. 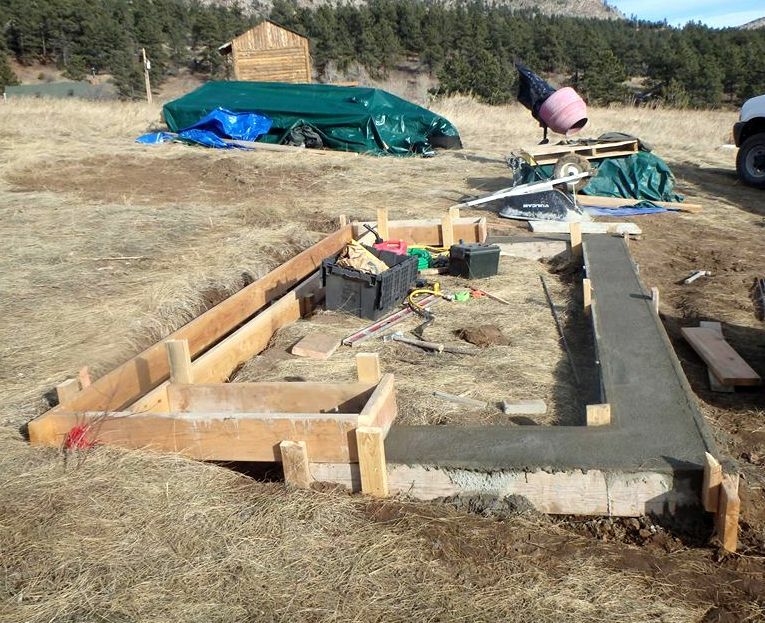 The Grade Beam is such a good way to save on material cost (both excavation and concrete). A Rubble Trench can be used if you are worried about heaving, but this is mostly a sandy subsoil. Here is the wood shed and “come along” that started it all. 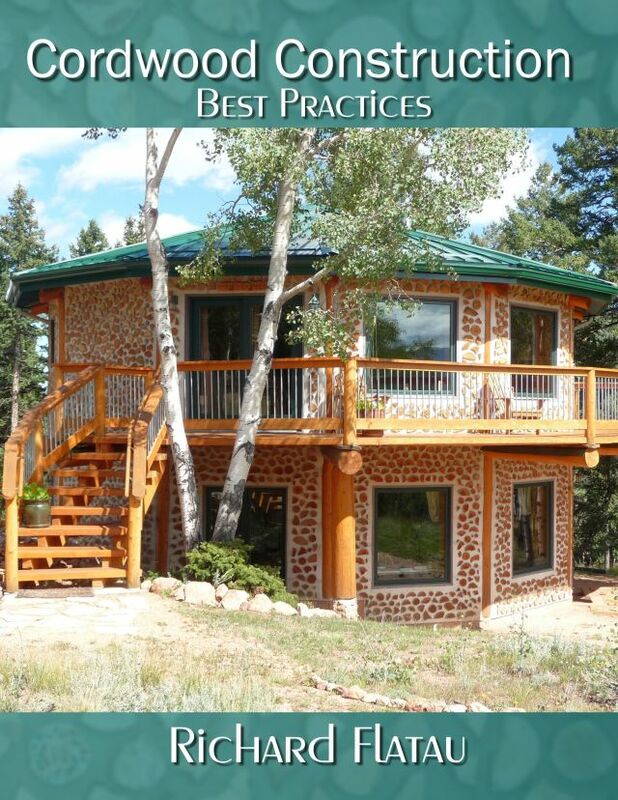 This is the practice building that endowed Peter and Ann with manifest confidence to tackle the Tiny Cordwood Cabin. 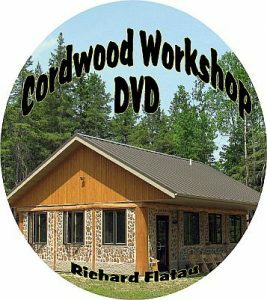 Here is a picture of the DVD label on the best-selling Cordwood Construction video. 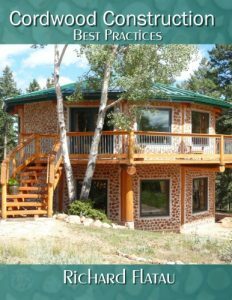 It has been getting rave reviews for its incredible detail, clear instruction and how it breaks the cordwood tasks into manageable sections. 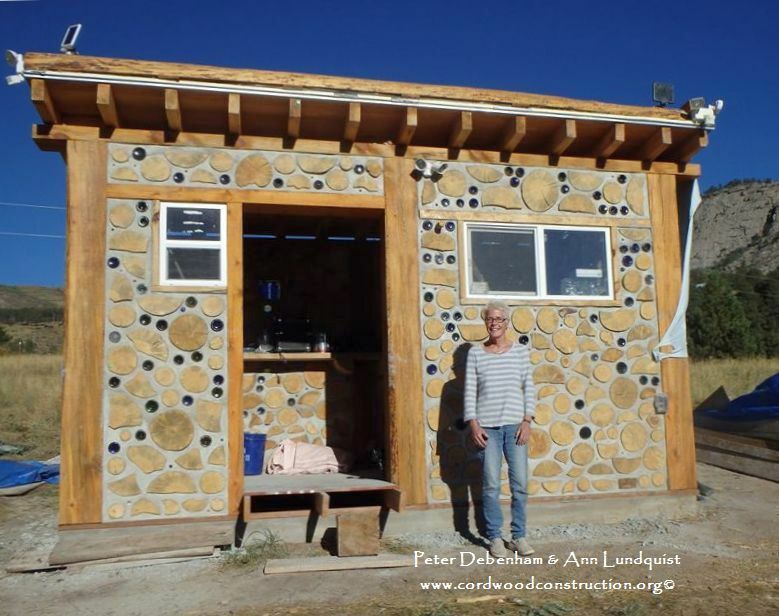 There are 30 menu items from the foundation, framing, electrical, plumbing, wall building, materials, special effects, bottle bricks, best practices, drone views of outstanding cordwood and so much more. Order yours today.